When attending events at Odyssey, parking spaces are at a premium. It is highly recommended that visitors park behind the school in the parking lot of the old University of West Georgia Campus. Please do not park in any of the numbered parking spots along the tree line as these are reserved for staff. 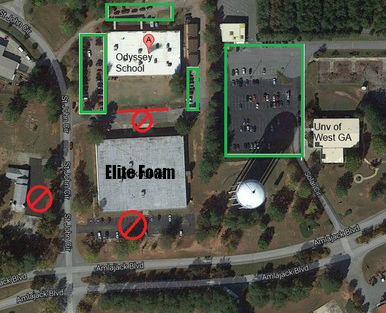 Please do not park in any of the numbered parking spots on the side of the school, alongside the building adjacent to Odyssey (formerly Elite Foam), along the fence at Odyssey, or at the church across the street at any time. Vehicles may be towed by the respective property owners.